They're all so beautiful ... but you've only got two feet! 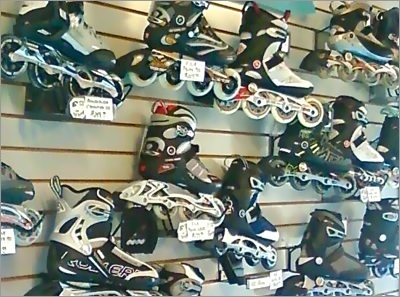 People walk into my shop every day looking for the wrong pair of inline skates. Weekend warriors want 110mm speed skates even though they've never skated before. Kids ask for hockey skates even though they want to skate the rails at the skate park. And then there was the mom, a newbie skater, who wanted pink Vaypors (and matching pink wheels) to push a jogging stroller. The truth is that with so many skates to choose from these days, it can be hard to find the one that's right for you. But don't get intimidated by all the choices. Answer the questions below and you'll find the right pair of skates in no time. The first question we ask our customers is, "What type of skating are you planning to do? " That question often stops people in their tracks; they often just say, "inline." But skates have become increasingly specialized over the years, so it's important to define the kind of skating you want to do. Within each category, there can be big differences. For instance, fitness skates come with wheels ranging from 76 to 100mm, molded urethane or aluminum frames, and high or low cuffs. 2) What's your ability level? If you are brand new to skating, with little or no related experience (skiing, roller skating, ice skating), we will steer you towards a more entry-level skate. These are skates that offer higher cuffs for support and smaller wheel sizes: 76mm to 84mm. The smaller wheel sizes are friendlier to muscles not yet developed for skating and keep overall speeds down a bit. Established skaters often want to upgrade from their current skate and go with wheel sizes 84 to 100mm. Experienced skaters also need less ankle support, so we will recommend a skate with a lower cuff that will allow for greater knee bend and less weight for the skate. On the other hand, we sometimes see beginners who can take off and skate right away, and long-time veterans who are reluctant to give up high cuffs and small wheels. The next question we ask is "How much are you planning to skate?" Do you want to skate around the block with the kids once a week or put in 15 miles a day to get in shape? Once again, wheel size can be important. Larger wheels offer more consistent speed, which can make it easier to regulate your heart rate zones for a consistent workout. Larger wheels also allow you to skate longer distances at pace and tend to be more forgiving over poor pavement. On the other hand, if you are skating with the kids on the cul-de-sac, larger wheels are a poor choice since they are less maneuverable and aren’t much good for standing around. The good news here is that inline skates are going to be much less expensive than you remember. Rollerblade and K2 have entry level skates starting around $100. These will typically come with 76 to 78mm wheels, molded urethane frames and ABEC 5 bearings. You can get 80mm wheels and aluminum frames starting at $139. Current year models with 84mm wheels and ABEC 7 equivalent bearings are at $159, and fitness skates with 90mm wheels are $200 - $210. You can even find 2009 close-out models for less money, although by this point in the season the most popular sizes may be gone. 5) What's your foot size? At Asphalt Beach, we do this for you. If you are buying online, or dealing with a big box that offers no help, remember that snug is best. All fitness skates feature soft-boot designs with foam padding around the ankles. The foam will pack down as the skate breaks in. So a little tight is better than too loose. Your skate should be snug enough to keep your ankle from moving during your strike and recovery. Too loose skates provide you with less control and often produce blisters. My years of measuring feet have taught me that most people wear shoes about a full size larger than their actual foot size. When you are trying on skates, start with a size below your shoe size and work up from there. And remember that skate sizes vary from brand to brand and model to model. One more rule on sizing: If they don’t feel right in the store, they won’t feel right later. OK. Those are the general rules for buying skates. The best bet for a novice skater is to seek guidance from the staff at your local skate shop. If that's not going to happen, take your time and try on as many skates as you can. The right skate is out there, waiting to roll away with you. Steve Larios has lots of experience helping skaters find the right skates. He is owner of Asphalt Beach, a skate shop he opened nine years ago in Nashville, TN. He is also the leader of the Asphalt Beach/ K2 Pro speedskating team and the founding member of Team Roadrash. He has been a skate instructor since the 1990s, first with the IISA, then with USSG and finally with Skate IA. 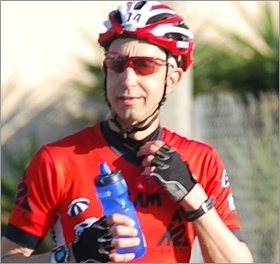 Last year, he traveled to more than a dozen races in the United States and Canada on his way to winning NROC's pro grand vet division.